The drug carter contains six small drawers and three large drawers, different drug kit for different storage needs. Four diameter 125 casters, two with locks, two without lock. With a trash, luxurious design, simple shape, beautiful appearance, coordinated. Body color coordination, nice, create a quiet, relaxed working atmosphere. Designed various of functions, to create a highly efficient working environment. Select high-quality ABS engineering plastics, lightweight body, move flexible. Advanced technology achieve highly unity of modeling effects and functions. Looking for ideal Drug Delivery Cart with Trash Manufacturer & supplier ? We have a wide selection at great prices to help you get creative. All the Four Casters Drug Delivery Cart are quality guaranteed. 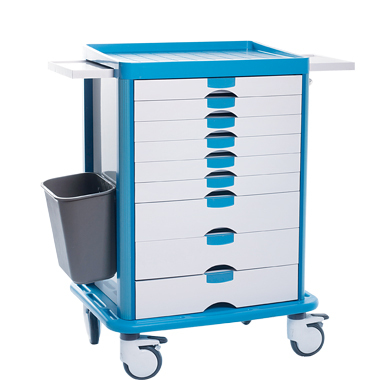 We are China Origin Factory of Six Drawers Drug Delivery Cart. If you have any question, please feel free to contact us.